Update, December 5: Anonymous former employees have revealed some detail on Gazillion’s final days in a new report. Marvel Heroes unceremoniously shut down just last week alongside the closure of developers Gazillion. The end of the game was sudden, coming a full month ahead of the planned shuttering on December 31. The news stood alongside long-standing rumblings of troubles within Gazillion, and did little to end those rumors. Speaking with several anonymous former Gazillion employees, a new report from Kotaku confirms many suspicions that had been circulating around the company. Marvel Heroes had been on a downward trajectory since launch, and Gazillion were banking on the ports to PS4 and Xbox One to bring in far more players serve as their lifeline. Employees were informed at an autumn meeting that those ports had not met executive’s forecasts, and this was followed by staff layoffs in September. In October, staff learned that the studio had lost the rights to the Marvel license, but executives reportedly said they were in active negotiations to retain the rights. But still, it didn’t become clear how dire the studio’s fortunes had become until November 10, when much of the studio’s staff was put on unpaid furlough. That was just a few days before the end of the game was officially announced. Several employees were counting on the distribution of unpaid PTO to carry them through the layoff and Gazillion’s closure, but the insolvent studio will apparently not be paying those debts. Two former employees tell Kotaku they are each owed around $5,000 in PTO. Update, November 27:Marvel Heroes is officially gone, with servers on PC and console having shut down earlier today. Hearsay behind the scenes suggested that Marvel Heroes would be shutting down last Friday, but players got one more weekend with the game before it shut down. All versions of the game officially came to a close a few hours, with servers on PC and console all now offline. Theofficial websiteis also down, returning a server error when you try to access it. With Gazillion’s sudden shutdown, players who have recently put money into the free-to-play game are left with little recourse. Platform holders would presumably be eating the cost of such refunds, since in-game purchases would have already been paid to the now-insolvent Gazillion. That’s less of an issue on PC, where players have had years to enjoy the game and their purchases, but is more significant on console where the game has only been out a handful of months. It seems Microsoft are issuing blanket refunds on Xbox, but Sony are reticent to do the same. But even more significant are the effects on Gazillion’s employees, who are reportedly denied severance and PTO owed as a result of their termination from the company. That’s terrible at any time, but stings even worse now, just before the holidays. Yet again, it’s unclear who would foot the bill to pay what’s owed. Update, November 23:Sources have confirmed that Gazillion is laying off the bulk of its staff and shutting down Marvel Heroes tomorrow, a month earlier than planned. Allen’s sources also say that Gazillion employees were informed that the company had lost their license with Disney to the Marvel properties on the 23rd of October. Development continued, but they were not allowed to publicly discuss the loss of the contract or the reason for a lack of announcements. They stayed on until November 10th, at which point they were informed that they were all furloughed as of the 11th. This explains the company’s silence over the last month. Update,November 22:Reports have begun to circulate that all Gazillion’s employees have been fired and that Marvel Heroes will shut down this Friday. Reports today suggest that Gazillion have fired all of their employees, and plan to shut down Marvel Heroes on November 24, over a month ahead of the planned end on December 31. News of the game’s early shutdown has come via screenshots of their Discord server from multiple sources. MassivelyOP report via an anonymous source that the company’s creditors have essentially pulled the plug, leading to employees being terminated without promised benefits. Multiple former Gazillion employees have essentially confirmed the news on social media. We’re still in the hearsay stages of this one, but given the struggles Gazillion has had in recent months these reports are hardly surprising. We’ll continue updating as we learn more. Original Story, November 15:Marvel Heroes, the Diablo-like multiplayer action RPG, will soon be shutting down, as Disney have ended their relationship with developers Gazillion Entertainment. There are not yet any details on how or when the shutdown will occur, or if existing players will be compensated for recent purchases in the free-to-play game. Things have been rocky for Marvel Heroes for some time, as the developers have missed repeated community updates, and the expected promotional tie-in for Thor Ragnarok never materialized. Anonymous current and former Gazillion employees report to Kotaku that several individuals working on Marvel Heroes were asked not to return to the office this week. 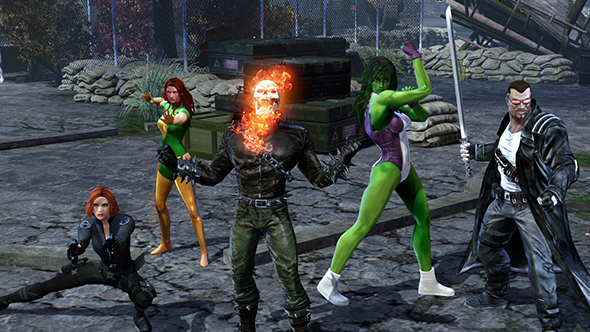 Marvel Heroes launched in 2013 to mixed response, but things seemed to improve in a series of updates which culminated in a 2015 relaunch. Since then, however, players have been critical of the game’s direction, particularly given an increasing lack of parity between the original PC release and more recent console versions of the game.